The Hotel industry in Addis Ababa is booming. One of the various reasons for this development is that the city, as it has been the location of the African Union (AU) since 2002, is now known as the political and economic center of Africa. 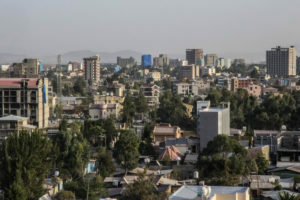 The United Nations Economic Commission of Africa (UNECA) is also settled in Ethiopia’s capital. Aside from that, Addis Ababa has the third highest numbery of diplomatic missions in the world (Sustainable Tourism Master Plan 2015, 57). Therefore, it has become the “leading conference and event tourism destination in Africa” (p. 57) and is of particular interest for political personalities as well as for tourists who look for a diverse insight into the African continent. The tourism sector has developed quickly over the past decades. In 1990, there were 64,000 tourists visiting Addis, in 2013 it already had been 681,249 (p.18). Additionally, Ethiopia won the Tourism Award for the Best Tourist Destination by the European Council on Tourism and Trade in 2015. The country is known for its beautiful landscape and rich ancient culture. It also offers nine UNESCO World Heritage Sites at the moment with six more on the tentative list. The Sustainable Tourism Master Plan (STMP) 2015-2025 from the UNECA presents different strategies to develop the Ethiopian economy through the tourism sector and defines the goal for Ethiopia to become “One of the Five Top Destinations in Africa” until 2020 (p. 18). Addis Ababa is described as a “dynamic city with vibrant cultural and entertainment options” (p. 57). The many international standard hotels like Sheraton, Radisson, Hilton etc. are another important asset to the city (p.57). The construction of new hotels is happening quickly, and other fields still have to adapt to this development (p. 66). Part of the plan to utilize the potential of the tourist sector is a strategy that focuses on Human Resources. In 2013, 3.8% of the total employment stem directly from the tourist industry (p. 18). “The availability of skilled human resources is a major challenge facing the tourism industry in the country” (p. 70). It is also described as the key to success in international competition. PROJECT-E takes advantage of the potential that lies in this area and “contributes to socio-economic development and poverty alleviation” (p. 20) by providing well-educated and equipped working force for the field. The women who are being educated in the PROJECT-E Hospitality Institute learn English, hotel operation as well as social and personal skills like self-confidence and perseverance for their future work place, which are all aspects specifically mentioned as lacking in the STMP. The established network and 15 partner Hotels of PROJECT-E, for instance the Hilton Hotel, add to chances for the students getting a job or internship at a renowned Hotel in Addis Ababa. That also means that women coming from disadvantaged backgrounds can have their own income and thus, be independent from men and family. One of the values that is being addressed in the STMP is “to ensure that men and women will have equal access to economic opportunities, skills training, employment, resources and decision making” (p.101). PROJECT-E provides what is currently needed in Ethiopia’s tourism sector: It contributes to women’s lives and rights and the economy at the same time!